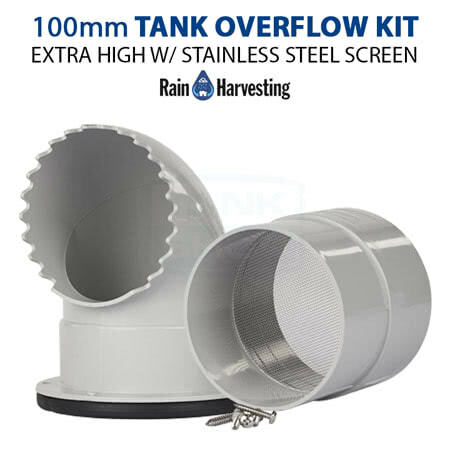 The 100mm Extra High Tank Overflow Kit (TATO23) comes with outlet and 90 degree elbow, gasket, mosquito-proof stainless steel screen and screws. The curved 90 degree bend is turned upward inside your tank, increasing your tank's harvesting capacity to 15cm higher than a standard overflow. Everything you need is in the box to help make installation a breeze. 100mm extra high tank overflow, stainless steel mosquito-proof screen, rubber gasket, stainless steel screws. The 100mm Extra High Tank Overflow Kit (TATO23) comes with outlet and 90 degree elbow, gasket, mosquito-proof stainless steel screen and screws. The curved 90 degree bend is turned upward inside your tank, increasing your tank’s harvesting capacity to 15cm higher than a standard overflow. Everything you need is in the box to help make installation a breeze.